"These are the perfect Bluetooth headphones for running, working out in the gym, or just daily activity where you want to be free from those annoying wires. Stylish, comfortable and easy-to-use, simply connect these wireless earbuds to your smart phone, tablet, or other Bluetooth enabled device and enjoy your new found audio freedom. 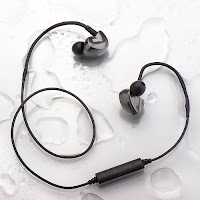 The FSL Reflex are not only the best Bluetooth sports earphones available, they are simply the best Bluetooth earphones." I was sent these lovely earphones from FSL to review. These earphones costs $34.95. Shipping is free with Amazon Prime. This set of earphones arrived safely to my house. They came packaged in a nice flip box that houses all of the components nicely. The box opened to a hard case, a charging cable, and instructions. The instructions were very easy to follow, even if you aren't yet familiar with pairing things via Bluetooth. I opened up the case, and I found a nice mesh net holder with the earphones wrapped up. The case zips all around. There were also different pieces to fit your ear size. This uses a microUSB to charge, so you can use any cord, but the case does include one. All that you have to do is flip the little piece up and plug them in. The earphones have a control block right in front so you can answer calls, control your music, and turn up the volume. The earphones do not flex and twist, so they really have a nice hold. Comes with nice case and accessories. I have not found any cons of these earbuds. I use headphones quite often, so it's imperative that I find a pair that will last me (at an affordable price) without sacrificing quality. I usually go back and forth between Bluetooth headsets and wired ones-- it depends what I am in the mood for. If I am exercising, I always use Bluetooth because they are lighter and do not get in the way. The sound quality impressed me-- sometimes earbuds leave me listening to two things-- the music and the background noise. I got used to it, but I don't care for it. These, on the other hand, have been really good with that-- they don't let as much of the background noise to bleed through. The sound quality is phenomenal when I consider the clarity, the range, and any interference. I love that I am able to size them to match my ears, since I have tiny ears. I definitely recommend these, I am very happy with them! Are you wanting to try the FSL Reflex Bluetooth Sport Earbuds, too? Click the link below, and order away! Thanks for making this job easy for me for reviewing RIF6 Digital Wireless Headphones. I was recently thinking to go for it and your recommendation really helped me. Thank you. I really like what you describe, it's very nice to read this.